So tell me about Death is a Clingy Ex. 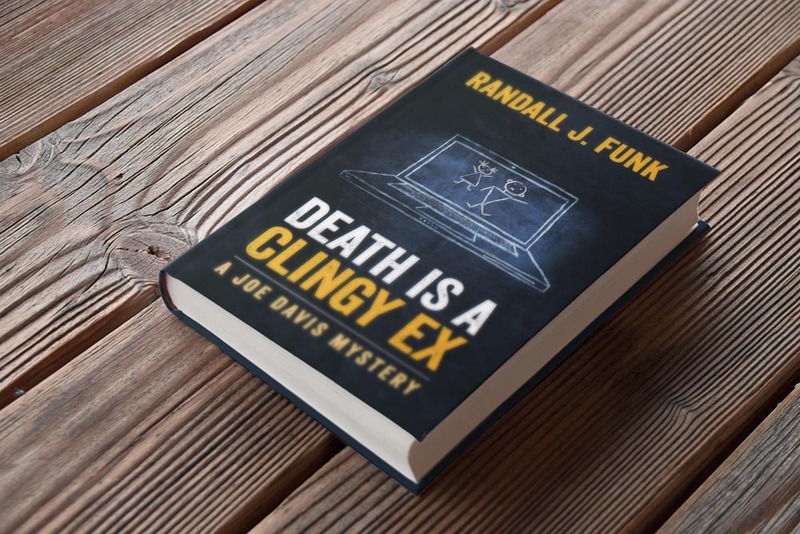 It is a fast-paced, funny, mystery about a humor blogger named Joe Davis and an entanglement with his most recent ex-girlfriend. Joe works for The Daily Bugle, a zine that was once a free newspaper. Think of the City Pages if it was web-only. And let’s not rule out that possibility. At any rate, Joe is asked by his ex, Tess, to accompany her to a corporate event because Tess believes that a jealous worker is going to try something violent at the party. Joe only goes along out of guilt over their break-up. At the party, though, Tess’ boss is killed and Tess becomes the prime suspect. And since she doesn’t have anyone to turn to, she asks for Joe’s help in clearing her name. And then we’re off to the races. Joe and his idiot friends manage to piece together a conspiracy and start to wonder if Tess isn’t maybe behind the whole thing. Is this a one-off or the beginning of a series? I definitely see it as the beginning of a series. I have the second book, Death Lives Across The Hall, nearly completed and I’ve started plotting out the third book, Death Wears A Big Hat. And I’ve got plenty more ideas. Tell me about the process of trying to get Death is a Clingy Ex published. I spent about three years shopping the book around to various agents and small presses. It’s always been difficult to get published via the traditional route, obviously. But it’s gotten to be a near impossibility in recent years. The publishing industry is in a state of flux and the powers that be are terrified of pouring money into a book that doesn’t find an audience. And you, the writer, have three chapters—if you’re lucky—to convince them that not only are you a good writer, but that your book will sell. Yes, some writers are able to do that. And some people are able to win the lottery as well. Why go the self-publishing route? One, I have an absolute, complete, unwavering belief in the quality of my book. Is it the second coming of The Great Gatsby? Of course not. Is it an entertaining and fun read? Absolutely, yes, yes, yes. Second, the opportunity and ability to self-publish is better now than at any point in the past. There are a number of self-publishing platforms available. The rise of e-books makes getting your work out to the general public easier than ever before. And frankly, it’s more democratic. I figured I had one of two options: I can spend the next several years of my life knocking on doors, so to speak, and getting them slammed in my face. I can spend all of my time hoping to find that one person that’s willing to give me a chance. Or I can put my work directly to the public. The way I look at it, either my work is worth somebody’s time or it’s not. If I go directly to the public and the response I get is, “Well, thanks, but no thanks” then it doesn’t matter how many industry people I query, it’s not going to happen. Because the public doesn’t want it. But I’d rather hear that from the public than someone who thinks they know what the public wants. Are you worried about the stigma that seems to go with a self-published book? Worried? No. I can’t control what people think. I will say, though, that plenty of very successful authors have struggled to find a publisher at the beginning of their careers. J.K. Rowling’s first Harry Potter novel was roundly rejected by publishers. Two Minnesota authors, Steve Thayer and Vince Flynn, both self-published their first books and went to successful careers. Did they struggle because they weren’t talented or their books weren’t going to find an audience? No. Sometimes, more frequently than they’d probably care to let on, the publishing industry simply gets it wrong. Can we expect other series from you? I have a couple others in mind. I’ve got a series idea that centers around a Twin Cities actor named Jim Sullivan and would take place in the world of small theatre. I’ve got another idea for a P.I. series that would begin in 1946 in St. Paul and every entry in the series would take place in another year going forward. Tell me about your writing process. Do you prefer outlining or just sitting down and writing? Yes is the answer to that. To be honest, my process is kind of a work in progress. I didn’t use an outline at all for Clingy Ex and I outlined Death Lives Across The Hall to the nth degree. I didn’t find that either approach was some sort of magic elixir. They both required extensive rethinking and rewriting. Every book is its own adventure, y’know? Your background, for the most part, has been in theatre. How has that affected your writing? It’s been good on a number of levels. One, it’s helped me with dialogue. Reading and performing as many plays as I have over the years has, I think, given me an ear for dialogue. It also helps give me a sense of scene; of when to start and when to finish a scene. Plus, I’ve been a part of two start-up theatres and that’s helped frame my experience for starting a publishing company. The more I look at my goals with the publishing company, the more it reminds me of my initial goals with the theatre companies. You keep your goals modest. Just sell enough tickets—or in the case of the publishing company, enough books—to keep yourself in business. Make sure you’ve got the ability to do another one. And you have to stay open to learning new things, admit you don’t know what you don’t know and keep your attitude constructive. And honestly take stock of what you did right and what you can do better and move forward from there. Where does the name Ghost Light Press come from? From one of the theatre companies. Ghost Light was first runner up for the name of theatre company. I’ve always liked the name. It invokes a sense of mystery and atmosphere and on top of that, it’s a theatre term. So, mysteries and theatre. My whole background. Who are your influences? Who do you enjoy reading? Mystery-wise, I love Carl Hiassen. His stuff is intriguing and makes me laugh out loud. In a totally different vein, I love Dennis Lehane. There’s nothing in my writing that’s comparable to his, but I love his work. I’m very drawn to classic mystery literature. I’m a Sherlock Holmes fanatic. I very much enjoy Agatha Christie. I read Edgar Allan Poe every fall. I’m a big fan of my friends Ellen Hart and Jessie Chandler. And it wouldn’t be summer if I didn’t read Janet Evanovich’s latest Stephanie Plum book. Comedy-wise, I love stand-up comedy. Louis CK is probably the funniest person on Earth. George Carlin, Richard Pryor and Bill Hicks were all brilliant. I also love just about anything with Tina Fey’s name on it. And, of course, my biggest influences that direction: Dave Barry, who taught me what comedy looked like on the page, and David Letterman, who taught me just about everything else about comedy.